Users may log into VR.World using the "Login" menu item - once logged in, this will change to "Profile", where users may review their account details. Currently the only benefit to logging in is to access the "Support" section from within the mobile app, this is also accessible externally at this location. An internet connection is required in order to log in to VR.World via the mobile app - this option will not function when connected directly to the iSTAR Pulsar device. Users may frequently use this option, it is used to register Wi-Fi networks with iSTAR Pulsar for the purpose of uploading data and updating firmware - further details on using this option may be found in this article. Allows users to directly access this Help Center from within the mobile app, where they may browse all support materials and manage their support requests. Users must "Login" to VR.World via the mobile app and have an internet connection to be able to access this option. Users may manage connections to multiple iSTAR Pulsar devices here. This would only likely be required if a user had their mobile device and multiple iSTAR Pulsar units connected to the same Wi-Fi network, and wished to switch between units with the mobile app. Unit of Distance: Allows users to choose whether to display distances within the app in miles or in kilometers. Copy to USB-C: This option is only active when connected to an iSTAR Pulsar+ unit. Allows users enable or disable the facility to copy capture data to a connected external drive. Upload to VR.World: Users may enable or disable the facility to upload data from iSTAR Pulsar to VR.World via Wi-Fi connection. 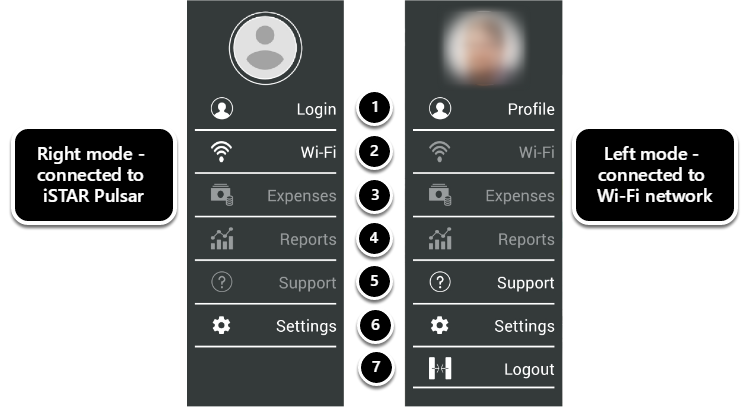 Application Version: the version of the mobile app being used. 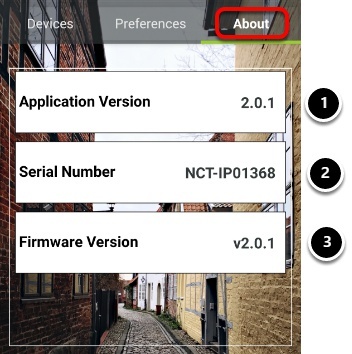 Serial Number: the serial number of the device that the mobile app is currently connected to. Firmware Version: the version of firmware installed to the device that the mobile app is currently connected to. Only appears if a user is already logged into VR.World via the mobile app. When selected, logs out the current user.